Khartoum — Clinical immunologists announced the continuation of their strike on non-emergency 'cold cases', the withdrawal from hospitals belonging to the regular forces, and private hospitals owned by those loyal to Sudan's Al Bashir regime. The Sudanese Central Doctors Committee called on young physicians serving their National Service to strike on cold cases in government hospitals and withdraw from all regular hospitals. As reported by Radio Dabanga last week, the Sudanese Central Doctors' Committee announced the withdrawal of all doctors from the military and police hospitals in the country, and from the El Amal hospitals that are owned by the National Intelligence and Security Service (NISS), in protest against the killing of peaceful demonstrators. The doctors will also refrain from providing any medical services in hospitals established by prominent members of the ruling National Congress Party "whose revenues are used to support and enable this regime," namely Alzaytouna, El Sahiroun, Yastashfoun, Dream, Sahar and Alia hospitals in various parts of Khartoum. The Unified Office demanded that young recruit doctors should not begin compulsory service procedures at the present time, and refrain from receiving movement orders. Violent incidents against doctors have accumulated in the weeks of protests. Two doctors were killed with live ammunition last week. On Thursday, a security force stormed El Feisal Specialised Hospital in downtown Khartoum, broke its glass gate and then fired tear gas inside the emergency section. The report was corroborated by Amnesty International. On Wednesday January 9, government forces entered the Omdurman Teaching Hospital and fired live bullets and tear gas in their pursue of wounded protesters from earlier that day. 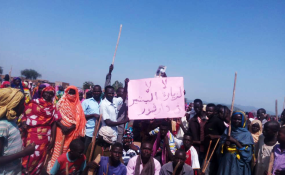 They marched into the emergency and medical sections of the Omdurman Hospital roughing up both patients and doctors.